But cannot find any definion of what it means. If you can tell me that would be great. Probably just an unusual abbreviation of sforzando, which is usually "sfz". It has effectively the same meaning as an accent. As it is, it's not an actual abbreviation that's accepted. As the others have said, sfortzato or sfortzando are the probable connotations, both meaning a sudden sound,but subtly different, in amongst 'ordinary' playing. I would achieve this by lifting the strings, and letting them go, so they hit the fret/fingerboard. This gives a percussive sound in comparison to plucking in an ordinary way. That's sf or sfz on guitar. The only sfr is a French telecom service. It means sforzato which in English means "force" or "forced". Not the answer you're looking for? Browse other questions tagged guitar notation classical-music or ask your own question. Is there a specific name for Sheet music that uses numbers (二胡 Èrhú Sheet Music)? What does Grt. and Sw. mean in this organ score? How does a tab guitar player learn sheet music? Piano Vocal Guitar sheet music? 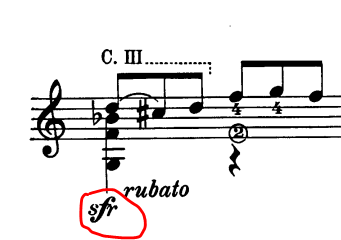 What does a pair of long horizontal lines between two whole notes mean? Where can I get a pen that draws sheet music?